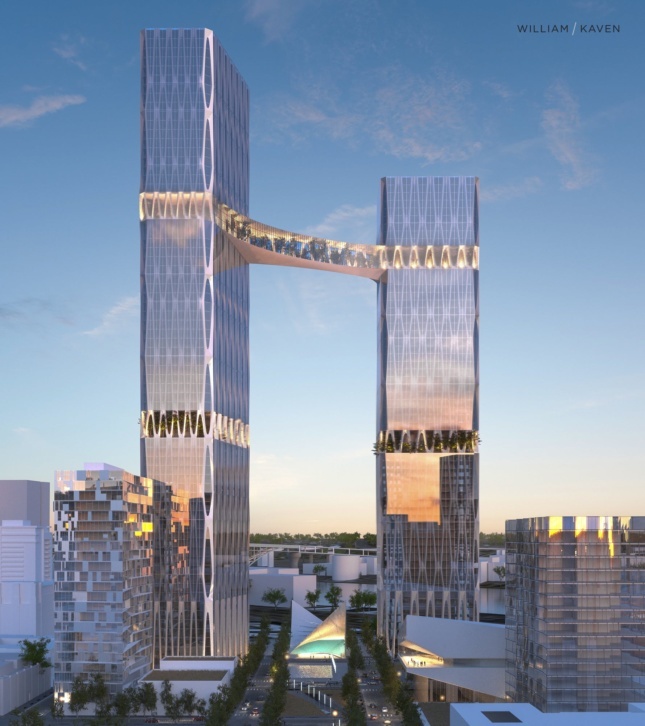 A recently proposed pair of twin towers by Portland, Oregon–based William Kaven Architecture (WKA) could become the tallest buildings in Oregon and among the tallest structures on the West Coast if built according to current plans. WKA is proposing a pair of diagrid-framed structures on a site formerly occupied by a regional U.S. Postal Service headquarters in Portland’s Pearl District, with one of the towers rising 970 feet high. The towers would be connected near their apexes by a monumental sky bridge. The tower’s so-called “botanical bridge” would sit roughly 680 feet above grade according to current plans. The towers will also feature mid-body planted terraces and will be connected along the ground floor by a public park. 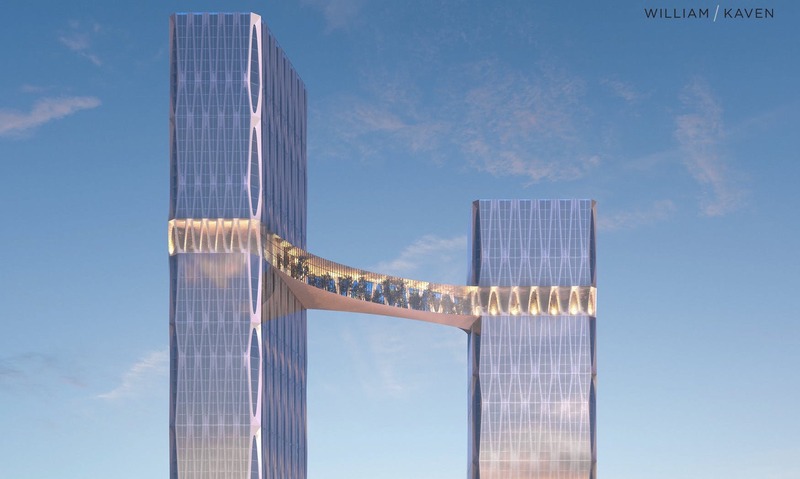 The sky-bridge would create a new tourist destination for the city, according to the architects, on par with Seattle’s Space Needle and the Eiffel Tower in Paris. If completed, however, the tower’s height would still fall a good deal behind the Wilshire Grand in Los Angeles by AC Martin and the Salesforce Tower in San Francisco by Pelli Clarke Pelli, which rise 1,099- and 1,070-feet high, respectively, due to their spires. The project site was recently purchased for $88 million by Prosper Portland, a local urban renewal agency that is seeking to turn the site into a mixed-use apartment hub, Willamette Week reports. In a recent Op-Ed for DJC Oregon, WKA principal Daniel Kaven laid out the argument for the firm’s twin tower proposal, calling the scheme a lynchpin for regional efforts to “fundamentally transform how people live in the [Pacific] Northwest” by creating an iconic, high-density node on a prominent urban site. In the article, Kaven argues that the region will likely see an influx of new residents as other regions across the country become burdened by climate change–related afflictions. The time to begin preparing for the influx of climate refugees is now—according to Kaven—and high-rise developments could provide a practical solution for adding more housing while also relieving residents of their cars.